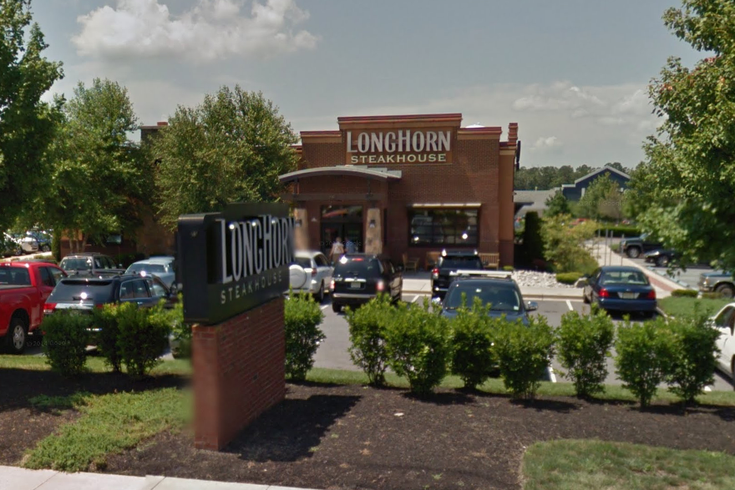 Longhorn Steakhouse in Millville, N.J.
A South Jersey waitress says she was fired recently over comments she made to customers about leaving their dog in the car, The Press of Atlantic City reports. Cristal Perez, 23, had worked as a waitress at the Longhorn Steakhouse in Millville since May 2014. Perez said she made comments to a couple she was serving on Aug. 11 about leaving their small dog in the car. The couple then complained to management. The Mays Landing resident said she immediately received a four-day suspension and was fired when she returned to work Sunday for violating restaurant policy about giving customers a good dining experience. According to Perez, she told the couple they were "wrong" to leave the dog in the car and that the woman "was lucky to be leaving before the cops came." Longhorn communications manager Hunter Robinson said the dog, which was special-needs, was left in the car with the air conditioning on. "The dog was never in any danger," Robinson told The Press of Atlantic City. "The police never came." A PETA spokesman said he doesn't agree with Perez's firing. "In any situation that has a compassionate citizen doing something to help an animal, most people would be rewarded and not get a pink slip," PETA outreach coordinator Dan Carron told The Press of Atlantic City. "Those people should be looked at as heroes and not lose their jobs." Robinson told PhillyVoice that the firing was more about Perez's behavior toward guests. "The decision to terminate the employment of this team member had nothing to do with her concern for the dog, which our management team confirmed was unfounded," he said. "She was terminated for mistreating our guests. We want our guests to be treated with respect and caring, and we want to provide an exceptional dining experience free of any confrontational or threatening behavior."